In its 49th sol on Mars, NASA's Opportunity had nearly concluded its scientific examination of the extreme southwestern end of the outcrop in Meridiani Planum. In the “Shark’s Cage” area of the neighborhood called “Shoemaker’s Patio,” featured in this image from the front hazard avoidance camera, Opportunity deployed its arm to study the features called “Shark’s Tooth,” “Shark Pellets,” and “Lamination.” “Shark’s Tooth” is a piece of the unusual red rind that appears to fill cracks in the outcrop. This rind may be some kind of chemical alteration of the rocks. “Shark Pellets” is an area of soil that was under investigation as part of the crater soil survey. “Lamination” is a target with very thin layers that resemble uniform pages in a book, an indication of how the sediments were deposited. A final experiment in this area will be attempted on sol 51. 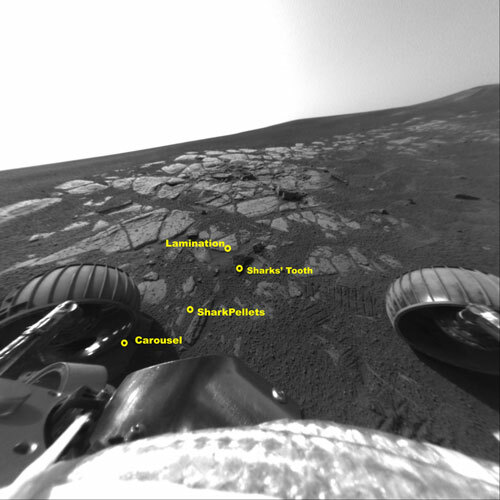 Opportunity’s front left wheel will “scuff” the rock called “Carousel.” “Scuffing” involves scraping the rock with one wheel while holding all the others still. This experiment essentially turns the rover wheels into tools, to try and determine the hardness of the target rock.